I am currently selling my Laurent Giles Columbia-class sloop, TERN (for those interested, check out laurentgilestrekka.blogspot.com). This boat is a sistership of John Guzzwell's "Trekka", which made a successful circumnavigation of the world in the late 50's. I acquired this great little boat in 2009 with the intent of going on another offshore voyage in it, but as my preps and projects on the boat neared their end, I realized that I really need a multihull to be able to sail to paddling destinations with a sea kayak and surf or whitewater boat, and subsequent equipment. It wasn't long after I made this realization that I was made aware of an interesting custom trimaran which was available and a good deal. The boat is a modified Walt Glaser design called a Sally Lightfoot. The guy that built her did an amazing job, and was obviously meticulous in the whole process. The boat sat for a while, so I am in the midst of some minor projects to get the boat in proper sailing condition, but I'm not worried--she's a diamond in the rough! Alas, life changed and my wife, Djuna, and I moved to Marin County, California in the fall of 2011. I realized that it was simply unrealistic to prepare our humble homestead for another resident to live in, change our whole lives to shift south, find work anew, and deal with a boat that wasn't quite functional from afar. So, I passed Tachyon on to a friend who had the time, resources and enthusiasm to grab the torch and keep running! He has since repaired the cabin house, made minor tweaks to the daggerboard, and gotten her up and running. It was a little hard to let this boat go, but it had come into my life due to other people's generosity, and I hoped that this same generosity might come back to me in the future. Then, in the early fall of 2012, I caught sight of a Locke Crowther designed trimaran for sale. My life had changed again, and I found myself single (after 14 good years with a wonderful woman), and needing a place to live. I realized that if I were to buy this boat, I could move forward with my SAIL 2 SURF project, live aboard to safe money and outfit the boat, and this boat would actually accommodate more than just myself for an extended trip. New name: "LUNG-TA", along with new mast. 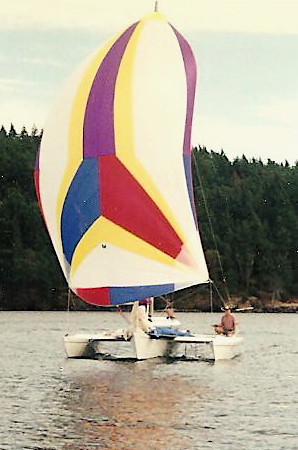 Odette is a 34-foot Locke Crowther Buccaneer trimaran. She's triple veneer cold-molded with epoxy and 1/8th inch Mahagony, and built very much like an airplane. The boat is cutter-rigged, and has a daggerboard and kick-up rudder, allowing access to shallow lagoons and estuaries. Accommodations are simple down below, with a chart table, two pilots berths, and simple galley, and comfy settee. For anyone used to expedition kayaking, and sleeping in a tent, the space is luxurious and warm. To the average lands-person, you might be disappointed unless you go sit in the rain and wind for a little while with a cold bottle of water to drink. When you then come below, have a warm mug of tea, change out of your wet clothes, and snuggle up to the propane heater and you'll swear there was never a more cozy space to be!